I had the unique privilege and good fortune of coming into a close and intimate touch with Prof K Swaminathan (1896-1994) in the last decade of his life in Chennai. It is given to God's chosen few to lead several lives which are distinguished by many dimensions of fullness. Prof Swaminathan lived a full life of creative endeavour and fulfillment, not only in terms of years but also in its multifarious facets. Starting his long career as a student and teacher of literature, for nearly three decades, he entered the world of journalism for a few years as political commentator and journalist and crowned it all with his historically celebrated term as Chief Editor of the Collected Works of Mahatma Gandhi (CWMG). I am relying upon the brilliant memoir of S Guhan, a consummate scholar in his own right and a nephew of Prof K Swaminathan, popularly known as Prof KS. He was born on 3 December, 1896 in Pudukkottai. His parents - P S Krishnaswany Iyer and his wife Dharmambal - were blessed with four children. The first born was daughter Veda, followed by three sons - Swaminathan, Venkatraman and Sreenivasa Sanjeevi. Like Prof KS, his brothers enjoyed long lives marked by useful activity and creative achievement. Dr K Venkatraman (1901-1981) rose to the level of the Director of the National Chemical Laboratory. Dr K S Sanjeevi (1903- 1994), retired as Professor of Medicine in the Madras Medical College. He was overlooked for the highest post of Director of Medical Services by the Congress government only on the ethnic ground of his belonging to the Brahmin community. Undeterred by this unjust disappointment, he founded the Voluntary Health Services, Madras, converting it into an efficient instrument of medical relief and service to the poor and the promotion of community health. All three brothers were honored with Padma Bhushan, an exceptionally rare event to occur in a single family in a large country like India with a population of more than one billion. KS went through his primary classes in the Lutheran Mission School in Purasawalkam in Madras. It is interesting to note that eminent novelist R K Narayan also went through the same school a decade later which he has vividly recapture in his autobiography My Days. In 1908, his family moved to Pelathope (literally, orchard of jackfruit trees) in Mylapore, a street off the road that connects Luz Corner with the Square around the Kapaleeswarar temple and tank. KS was enrolled in the PS High School, Mylapore and studied there from 1909 to 1912, completing his schooling. KS has left behind interesting reminiscences relating to his teachers and fellow students in his school days. Referring to P N Srinivasachari, one of his teachers who was an authority on Vaishnavism, KS has said 'that his regular lessons on Sanathana Dharma sowed the seed which had yielded the flower and fruit of many long years' happiness.' It was P N Srinivasachari who made KS read William James's Varieties of Religious Experience. The second teacher who left a lasting influence on KS was his Tamil teacher, B V Anantharama Iyer, who introduced to him to the glory of Sangam Poetry. Anantharama Iyer was a student of the Grand Old Man of Tamil Dr U V Swaminatha Iyer (UVS) and who later succeeded UVS years later on the staff of Presidency College. The third teacher, also a student of UVS was the famous Judge and playwright of later years, P Sambanda Mudaliar. He introduced the boys into amateur dramatics and theatre and personally supervised the rehearsals. Among his memorable contemporaries in school, KS counted M Bhaktavatsalam, future Chief Minister of Madras, Nityanandha, younger brother of Jiddu Krishnamoorthy and V C Gopalaratnam, who later became an eminent advocate in Madras. In May 1915, even when he was an under-graduate, he was married to Visalakshi, daughter of K Swaminathan, a well known public figure and lawyer of Puthucottai State. It was a very happy marriage and they were together for the next 79 years. Another important landmark in the long life of KS was his first encounter with Mahatma Gandhi in April/May 1915. Gandhi was then staying with G A Natesan, the legendary editor of Indian Review, in George Town. KS was assigned as a young volunteer to look after Gandhi's needs. He had the good fortune of escorting Gandhi to the Catholic Archbishop's bungalow in Santhome and to the Anglican Bishop's house adjacent to St George's Cathedral. Gandhi was trying to get the support of the Christian community for his Indian struggle in South Africa. A more significant meeting between KS and Gandhi took place in1920 when Gandhi was trying to find new life-time recruits for his non-cooperation programme, Harijan welfare and adult literacy and other connected welfare activities. KS was interviewed by Gandhi who told him: 'You may not join me now, but I shall call you when I need you and when you are ready.' Perhaps Madame Destiny had already decided that KS should act as Chief Editor of the Collected Works of Mahatma Gandhi in the distant future which did happen in the early part of 1960. After taking his BA (Hons) Degree with distinction from Presidency College, KS went to the Madras Law College and took his BL degree in 1919. He served as a junior under the formidable S Srinivasa Iyengar who later became President of the Indian National Congress. After completing his apprenticeship, KS went to Puthucottai to practice under his father-in-law. He got embroiled in a national political agitation in Puthucottai by inviting the Congress leader Satyamurthi to address the Bar Association. The British government threatened to withdraw KS's Sanad (licence to practice Law). The government was willing to relent if only KS would offer an apology. But as a true and fearless nationalist, KS refused to do so. At this critical point of time, Rajah Sir Annamalai Chettiar came to the rescue of KS by giving him an appointment as Lecturer in the English department of Sri Meenakshi College which he had founded in Chidambaram. Rajah Sir Annamalai Chettiar also advanced money to KS to enable him to go to Oxford University in England for further studies from 1922 to 1924. He joined Christ Church College Oxford, and took his BA in English Language and Literature in 1924. During this period he came into contact with Gilbert Murray, Bertrand Russell, Hilaire Belloc and G K Chesterton. Dr Carlyle, one of his professors in Oxford, gave this testimonial to KS: 'His work for me was consistently of very high quality, and his knowledge of English literature is wide, but also precise and exact, and his critical judgement is excellent, independent and individual, but also sane and free from eccentricity. I am confident he will prove himself a first rate scholar and a most interesting and stimulating teacher.' This appraisal by Dr Carlyle in 1924 who had only confirmed the earlier assessment of Sir Mark Hunter in Presidency College Madras in 1917 indeed proved to be prophetic. On his return from Oxford, Professor K Swaminathan (K S) rejoined Shri Meenakshi College in Chidambaram which by now had become a part of the Annamalai University, as the Head of its Department of English. K S passionately involved himself in the task of organization of English Studies in the newly established Annamalai University. During this period, he delivered many brilliant University Lectures in Presidency College Madras which were marked by great learning, sound judgement and unsurpassed taste. Apart from being hailed as an outstanding Professor of English in Meenakshi College, K S also won the admiration of his Principal, K A Neelakanta Sastri (the eminent historian) who said: 'I know that his administrative capacity is equal to him eminence in scholarship. There is practically no department of college life which has not been galvanized into brisker activity and taken to higher level by his versatile talent and ubiquitous energy'. One of the most fortunate things that happened to K.S during the days of Chidambaram was his meeting with T K Chidambaranathamudaliar (T K C) who was a scholar, critic and connoisseur of all that was best in Tamil literature, music and dance. He had a tremendous cultural impact upon K.S and so much so that he became a great devotee of Tamil language and literature for a lifetime. As K S has stated: 'Originally I used to write only in English', I was afraid to write in Tamil. It was T K C who gave me the enthusiasm and confidence to study Tamil and to write in it. He was not only a friend but a great inspiration'. It was T K C who introduced K S to the verses of Guhai Namasivayam on Annamalai, the Holy Hill. M G Shanmukham , a student of K S, was the first to invite his attention about Sri Ramana Maharishi in 1927. However, K S had his first darshan of Sri Ramana Mahariahi at Thiruvannamalai only in 1940. S Guhan has rightly observed: 'The contradiction that K S perceived between the Maharishi and the Mahatma, between the pursuit of individual salvation and socio-political public action was to be a continuing concern. It was not something which could be put aside or passively contemplate: it had to be wrestled with and resolved. This process, as we shall see, was to underlie much of K.S's activities and writings in later years. A combination of fortuitous circumstances created by a handful of enlightened Englishmen, who were themselves Professors, enabled K.S to join Presidency College as Additional Professor of English in 1930. He became a legendary Professor of English in that institution during the next two decades. Even today, he lives in the lives and memories of his innumerable students, disciples, followers, admirers and friends as the one and only incomparable Prof. K.S. Indeed for all of them, he was a constant source of instruction, inspiration, practical solace and philosophical guidance at all times. As a teacher, K.S developed a personal relationship with all his students, attending to their individual academic advancement in the best tradition of the Oxford tutor which made one of his very distinguished students Professor Ramaswamy say 'Few of us regretted Madras was not Oxford in name. It was Oxford in fact'. Prof S. Ramaswamy was one of the most brilliant students of Prof. K.S. Later, Prof S Ramaswamy also entered the field of teaching and retired as Chief Professor of English, Presidency College, Chennai. He had paid this tribute to Prof K S: 'We enjoyed our classes and, most particularly, the discussions we were allowed to have with him in the classroom and oftener, outside it'. K S as a teacher taught not merely the values of literature but those basic things that matter to life - the values we ought to live by and which, one hopes, the majority of us at least try to live by'. Dr Lawrence Sundaram S J was a student of Prof K S and later became a very eminent Professor of English literature. He also served as Principal of Loyola College, Chennai. It is interesting to see what he has written: 'I remember, once, I went alone to K.S to ask him how we should understand and interpret Shelley's Ode to the West Wind. We sat together and read the poem aloud and, for the first time in my experience, he made me sensitive to the orchestrated music, the color and imagery of this masterpiece of poetry. I had to teach the text of it to my B.A students and I hope they profited by what I conveyed to them. Actually I learnt more from personal encounters with K.S than from his class lectures'. Right from 1920 under the magnetic influence of Mahatma Gandhi K.S became an ardent nationalist. He took to khadi for a lifetime because he thought it was a livery of freedom. During his days in Presidency College, he always used to wear a khadi suit with a khadi tie. One of his students N S Jagannathan has said that English literature in the hands of K S became an instrument of Gandhian subversion, leading the students along the perilous path of passionate nationalism. At the time of Quit India Movement in 1942, K.S organized a meeting of students in Presidency College and made them pass a resolution supporting the national cause. It redounds to the credit of K.S that he made Papworth, the Principal of the College at that time, to participate in that meeting. K.S was promoted and posted as Principal of Government Muhammadan College (as it was then called) in 1948 and he retired from there in 1953. It was during this period that K.S quietly changed the name of the institution to Government Arts College. If any non-Muslim Principal were to attempt the same thing today, many Chief Ministers (particularly from Jammu and Kashmir) would be too ready to issue death-threats to him, tacitly backed by the diplomatic might of the Government of India! 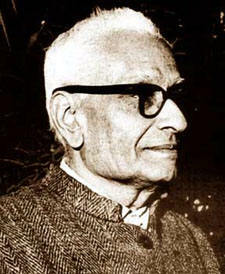 After retiring from Government service in 1953, K.S worked as Assistant editor of Indian Express from 1953 to 1959. During this period, K.S produced two major translations into English - Vinoba's Talks on the Geetha and the other of Rajaji's Ramayana. It was Vinoba who recommended the name of K.S to Pandit Jawaharlal Nehru for appointment as CHIEF EDITOR of the Collected Works of Mahatma Gandhi ( CWMG ) in 1959. K S took up this post in 1960 when he was 64 years old. At that time only three volumes had been published. K.S served as Chief Editor with unremitting toil for the next 25 years and by the time he left New Delhi in 1985, nearly 90 volumes were published. The 100th volume was released by Prime Minister Narasimha Rao in October 1994. K.S saw to it that his name was printed only in the final volume of the series along with the names of all those who had assisted him in the production of CWMG volumes. It was a supreme act of self-effacement by K S. He was honored with Padma Bhushan in 1972. What Boswell was to Samuel Johnson, K S became to Mahatma Gandhi. The meticulousness with which the writings of Gandhiji have been collected, translated and published would have been impossible but for Professor Swaminathan's (K S) labours. In addition, He established the Ramana Kendra in New Delhi which has done outstanding work to spread the spiritual message of Ramana Maharishi. K S was to Ramana Maharishi what St Paul was to Jesus Christ. His shining talents well employed'. Could I get to know when Dr. Fr. Lawrence Sundaram passed away? He was really a wonderful and inspirational teacher; he had taught me Higher English for the Indian Civil Services Examination in the I.A.S. Institute, Armenian Street, Chennai. His language could never fade away from my mind. I wish there could be many teachers like him today so the language, while making an impact on others would carry well the message that it conveys. In your article you had mentioned about Shiri. Anantharama Iyer, teacher of KS. I think his initial is E V not B V. Edayathimangalam, V Anantharama Iyer. He was a student of U V Swaminatha Iyer. I have his "Pozhippurai" for "Kalthokai". I belong to Edayathimangalam and Shri Anantharama Iyer's daughter Late Brahadambal w/o Late Ramanatha Iyer is my Periamma. What a great soul? While he adopted Gandhiji as his master, the Sage of Thiruvannamalai shaped Professor KS' spiritual thinking. The enthusiasm and verve with which he edited The Collected Works of Mahatma Gandhi can be gauged from the fact he accpeted only a pittance as a salary, while many of his juniors drew much more. He saw CWMG as a spiritual duty to be performed. What a wonderful life he led and how much he influenced his students! The very thought of Professor KS brings back days which just cant be recounted in words. His house used to be a debate spot of scintillating discussions between the Professor and his students. Those salad days will be ever trasured by his surviving students. May your tribe increase, Professor! very happy to know about a great man when i was searching about dr.u.ve.saa. the computer internet facilities have great thinking to bring together great people. When I was browsing literature relating to my Loyola Chennai Principal- Rev.Fr.L.Sundaram, I came across the details of Prof.KS and it is amazing to know how hard working and devoted to his professions was Prof.KS. My respects to one of the greatest souls.